Using the three included elevation rods, you can measure velocity at fixed heights from 4–19" above the stream bed. 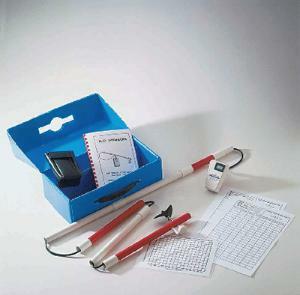 The digital LCD meter is stored in a protective carrying pouch, and comes with a sturdy impeller stick that disassembles into four sections for easy storage, an instruction manual with laminated velocity calibration sheets and data sheets, and a compact weather-resistant case that conveniently holds the flowmeter, all additional parts, and two AAA batteries. Size of carrying case: 8" x 14" x 7". Total pole length: 3 1/2', extendable to 5' with an overall 7' lead. Weight: 2 lbs.